The largest wave ever surfed? I’ve always loved Point Break, Kathryn Bigelow’s surf and shooting action movie in which Patrick Swayze leads the ex-Presidents, a gang of surfer criminals who are infiltrated by rookie cop Keanu Reeves. There’s lots of mystical man-bonding and heroics, but somehow it does manage to capture the amazing power of the ocean and the thrill of hunting for that perfect wave. On Tuesday 29th January, Keali’i Mamala towed out Garrett McNamara to surf on the monster swells off Praia do Norte, Nazaré, Portugal. 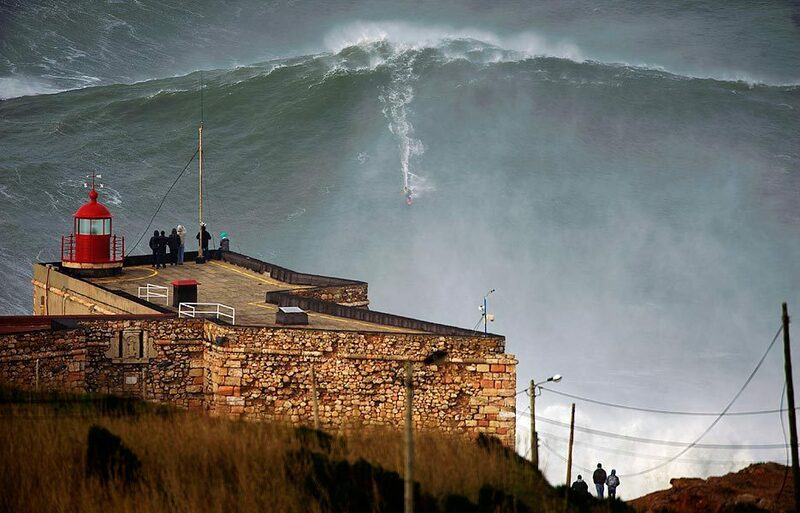 McNamara held the record for the largest wave ever surfed, a 90-foot beast also caught at Nazaré. What he may or may not have known, was that he was just about to break his own record, surfing a Leviathan wave that, as a body boarder more used to Cornish summer swells, I can barely contemplate: 100 feet high. To give you an idea how tall that is, it’s roughly seven Routemaster buses stacked on top of each other.